Monica Lee and I made this wreath to send a photo to all our friends. 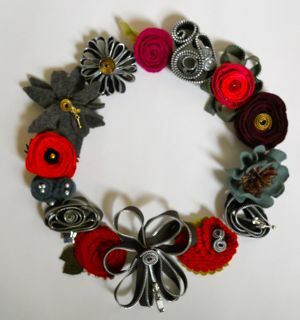 We are teaching flower making workshops this December and January and these are the examples we made for them. 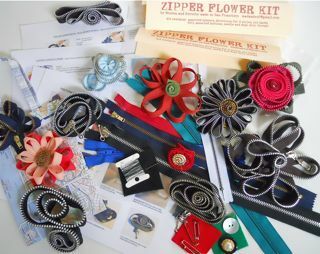 We have also collaborated to make Zipper Flower Kits. All the workshops that I or we taught have been filled, which gave us a reason to make the kits. This photo shows some of the sample flowers you can make with the bits and pieces that will go into the kits. You will be able to make a minimum of 4 zipper flowers. It will also contain step by step instructions.